Newly constructed cottage just 2 blocks from the beach. A short walk to town center and restaurants. Ideal for family getaways. 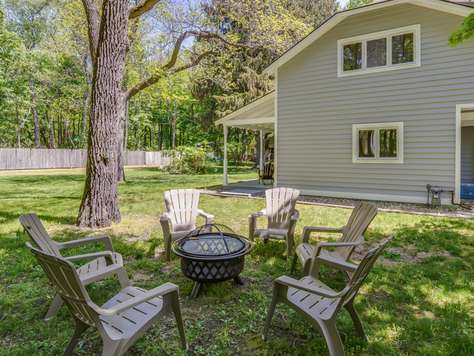 Make s'mores at the fire pit in summer or tell ghost stories there in the fall, this rental is available year-around. Enjoy a romantic weekend with wood-burning fireplace and master suite with a king-size bed and Jacuzzi tub. This property is Dog-friendly. A non-refundable fee of $100.00 per stay, per dog ( 2 dog max) is assessed during the booking process. 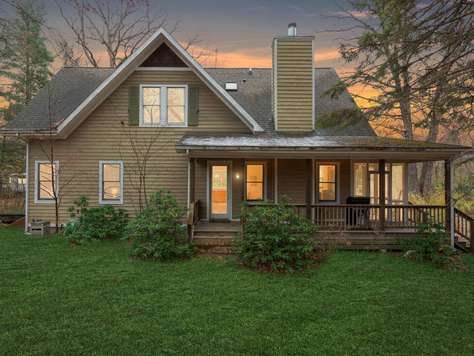 Delightful, cedar sided 3BR/2BA Union Pier cottage located just 3 blocks from beautiful Lake Michigan in the heart of Harbor Country. Single level living with open concept floor plan. Fully appointed kitchen with beautiful cherry cabinets, stainless steel appliances, carrion countertops, large breakfast island, and dining table with seating for up to 8. Vaulted ceilings with transom windows bring in natural light any time of day. In the evening, relax in the spacious living room in front of the fireplace. The master bed/bath features a king bed, separate shower, jetted tub, double sinks, walk in closet. French doors open up to the screened in back porch which runs nearly the length of the house. Two guest bedrooms with queen beds share a large bath. No need to pack – this house comes with everything you need for a day at the beach, including beach chairs & towels, and a wagon to carry it all! Central location puts guests within walking distance to beaches, restaurants, and Whistle Stop Deli and Grocery Store. Harbor Country sights and activities include numerous restaurants, shops, nature trails, kayaking, Warren Dunes state park, wineries, and local craft breweries and the Journeyman Distillery. Charming, well appointed 3 bedroom, 2 bath cottage on a secluded private lane one block from Lake Michigan and McKinley's Private Beach. A 5-minute walk to the heart of Union Pier's Market and shops/food/coffee. This bright and beautiful home also boasts a large flat and private yard with plenty of sunny and shaded areas and ample room for yard games and outdoor entertainment. Picnic table, two hammocks, and fire pit. Right in the heart of Harbor Country with a 5-minute drive to New Buffalo. Enjoy the beaches (you can walk for miles), restaurants, coffee, wineries, breweries, casino, garden and antique shops, golfing, and so much more. Decorated with love for a welcoming feel, the home includes many signs and artwork designed to create a peaceful space and foster positivity. This is a perfect place to get away with your family and friends to make fun and everlasting memories. Look no further, this is Meant to Beach!!! 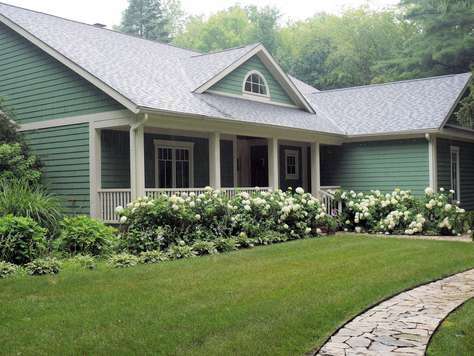 This home is in a very quiet and beautiful grounds. Newly constructed home is a 3 bedroom, 2.5 bathroom home with open floor plan and gourmet kitchen. 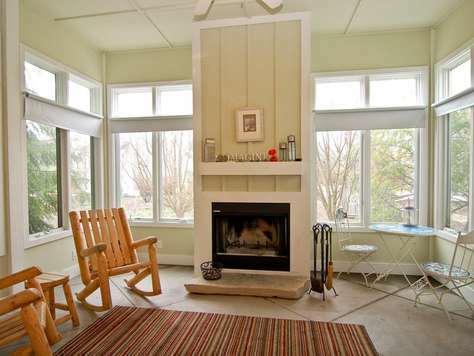 You can take advantage of the outdoors by relaxing in the spacious screened in area. This well appointed 3 bedroom 2.5 bathroom home was designed to provide a perfect family getaway. 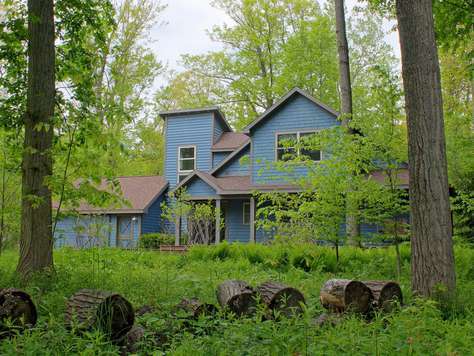 The home sits on almost two wooded acres of land, and is located less then two miles from the beach. The back yard is fully fenced in with tons of outside space for the kids( kids swing set included). In the backyard you will also find a outdoor shower with hot and cold water as well as a hot tub that is available year round. The kitchen has all stainless steel appliances and a granite countertops. The living space offers a wood-burning fireplace and seating for 6. There is a deck off the master bedroom with an outdoor shower and a 4-6 person hot tub. A larger deck can be found off the kitchen and living space for sun bathing and for all to gather. The front of the home offers a screened in area that you would find on a HGTV show, complete with tons of outdoor seating, two day beds, and a custom built outdoor fire place where you can enjoy a glass of wine, and the beauty of your surroundings. The home is located less then two miles from the beach in Union Pier and is less than ten minutes from downtown New Buffalo. Whether it's biking, antique shopping, wine tasting, going to the beach, or just hanging out, this home will provide it all. 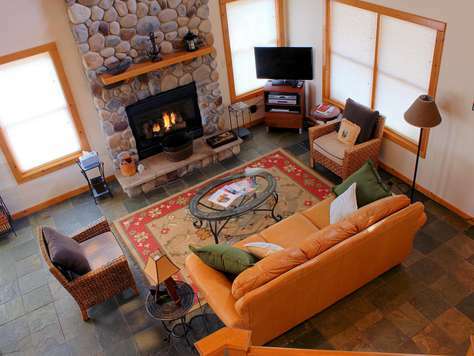 Peak Season Rentals: This property rents from Sat.-Sat. Is your group size is larger then what this property accommodates? We have another property conveniently located right next door to this one with a maximum occupancy of eight (8) -- Click here for more information. New construction, appliances and flooring. Gorgeous great room with majestic stone fireplace and beautiful hardwood floors. Large, modern, fully stocked kitchen with counters and cabinets galore with seating at island or table. 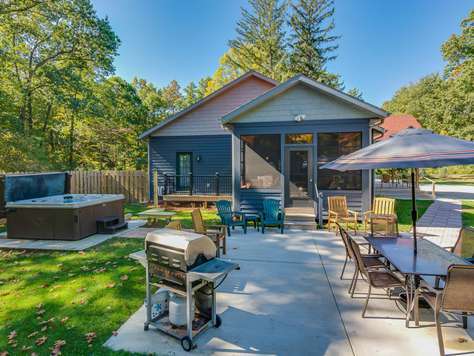 Three season porch with outside patio, grill, eight person hot tub and fire pit overlooking 1½ acres of back yard, play area and woods. Outside you will also find a private pool, with an outdoor shower area and bathroom. Large front porch with views on three sides. Three of the four bedrooms have outside access to private decks. Two of the 3 baths have double sinks and showers. Less than one mile to beach and 1½ miles to three other Chikaming beach access points with unobstructed sunset views. Enjoy wineries, back road bicycling and hiking trails and Warren Dunes State Park. Six miles to New Buffalo shopping and restaurants and the Four Winds Casino as well as antiques, the Journeyman Distillery and the Acorn Theater in nearby Three Oaks. Beautifully appointed home just minutes from the heart of Union Pier. The two story home offers over 1600 square feet of living space with three bedrooms and two and a half bathrooms. A wood burning fireplace along with the screened in porch are added bonuses. There is a deck for enjoying the outdoors along with a hot tub. The house sits on a cul-de-sac street on almost two acres of land and has a beautiful garden with a pond. Everything from golf, casinos, horseback riding, and kayaking are within minutes of the property, not to mention the many wine vineyards and restaurants. The fall and winter months bring pumpkin picking and cross country skiing as well as the most amazing color changes. Union Pier offers a little something for everyone. Come and enjoy a weekend away. Peak Season Rentals: This property rents from Sunday to Sunday. Is your group size is larger then what this property accommodates? We have another property conveniently located right next door to this one with a maximum occupancy of 6. Click here for info.